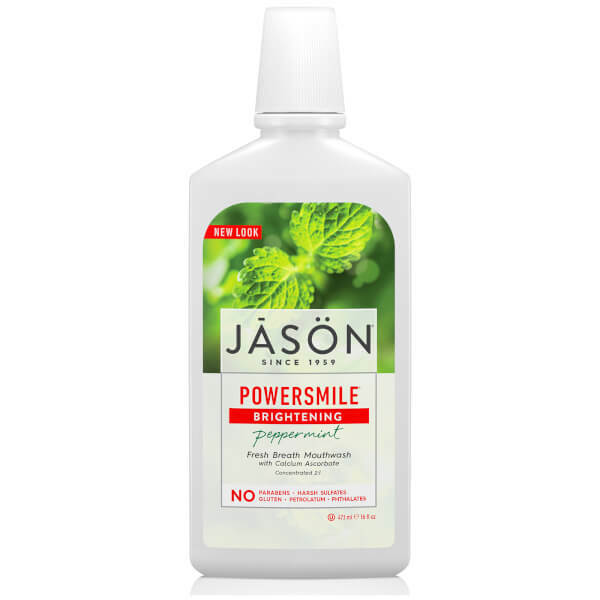 Freshen breath and brighten smiles with the Powersmile® Mouthwash from JĀSÖN, an effective all-natural formula free from alcohol, irritating chemicals or harsh abrasives. Peppermint Oil and Menthol provide a burst of freshness, whilst extracts of Grapefruit and Perilla Seed work to reduce tartar and plaque build-up. Aloe Vera Gel soothes inflammation of the gums, and it’s fortified with Calcium Ascorbate to help eliminate stains. Achieve an intensely clean mouth and polished, whiter-looking teeth. Free from alcohol, saccharin and gluten. Aqua (Water), Glycerin, Polysorbate 20, Aloe Barbadensis Leaf Juice (1), Calendula Officinalis Flower Extract, Carica Papaya (Papaya) Fruit Extract, Citrus Grandis (Grapefruit) Seed Extract, Echinacea Angustifolia Extract, Hamamelis Virginiana (Witch Hazel) Water, Hydrastis Canadensis (Golden Seal) Extract, Perilla Ocymoides Seed Extract, Mentha Piperita (Peppermint) Oil, Ascorbic Acid, Calcium Ascorbate, Menthol, Sea Salt, Sodium Bicarbonate, Xylitol.